Revamped to include the INTERNET! When the Versatility Hall of Farm (VHOF) program was started, the internet hadn't even been invented! Now it is a major part of life for a great number of people. It has been difficult to work out how many points animals should receive for internet exposure. However, as the point of the VHOF is to make awareness of longears know, and reward animals for their participation, it is important that we be able to allow fair point coverage for internet posting. If you are familiar with the VHOF awards you will notice some changes to wording as well as expanded point opportunities. 1 point for a "New arrival" photo, per month, posted on your home website or posted to a chat/group. 12 total points per year may be taken, no more. A new photo must be used for each point (12 pix, 12 points possible). 1 point for being chosen to participate on a Pet-of-the-Day contest or website. Add 2 more points if the animal is chosen as the pet-of-the day (includes www.equusite.com). Add 3 more points if the animal wins a Monthly overall posting on a site such as Equusite. Add 10 points if they win the Pet of the Year cumulative posting on a site such as Equusite. 1 point if a photo is posted in show results or a write up about a show by the club or host organization. 1 point if the photo is picked up by anyone outside of your group for discussion on color, conformation, or performance (you may not cross post to gain this point). Only 1 point per animal, per month, new photos each point, 12 total per year allowed. We prefer that the majority of the points be for non-internet (ie public) events where the general public can actually get out and see your animal. But also we understand that a lot of information is shared over the internet and in print, so we want you to be able to benefit from other forms of educating about longears! The American Donkey and Mule Society VERSATILITY HALL OF FAME award is an award for which any breed, size or type of donkey, mule, hinny or zebra hybrid is eligible. This award is designed to acknowledge those animals and their owners who promote the breeds to the public through activities that demonstrate their animals' versatility and usefulness. The purpose of the award is to recognize the people who use their animals in many various ways in an effort to both improve the animals and improve their image to the public. Animals are awarded points in many fields of endeavor, reflecting the above values, and the award is designed to reward the versatile and hard-working donkey, mule, hinny, and their owners. General Rules and point systems apply to all three programs, but individual differences in the programs are noted below. Who may enter: You may enter any donkey, mule, hinny, zebra hybrid, youth or farm which raises, keeps or shows these animals. Animal Entrants: The animal entered must be registered with ADMS. You may enter your animal in the HOF program either at the time you register it or any time thereafter. If you wish the owner/handler to be honored with the animal on the trophy (VHOF first award only) please put down the name of this person. At the time your trophy is made up, you may designate a change in this if circumstances have changed. Youth Entrants: You may enter any youth 16 years or under who is a member of a family that is current in membership with the ADMS. All memberships in ADMS include the immediate family. We will also allow grandchildren of ADMS member families if the grandchild is active with the grandparents? animals. If, however, the youth is active with the parent?s animals, the parents must be the ADMS member family. Animals that the youth uses should preferably be registered with ADMS and must be donkeys, mules or hinnies. Horses and ponies do not count towards Youth points. Farm and Ranch Entrants: An ADMS member who wishes to enter his farm or ranch for the award must register the farm name with ADMS. To do this, simply send the $7.00 farm name registration fee and the name of the farm along with the name and address of the owner(s). If the name has already been taken by someone else, we will notify you and work out an alternate farm name. If you wish to check ahead of time as to whether or not someone has already registered a farm name, please call the office at 972-219-0781. For this purpose we will not duplicate farm names nor prefixes that contain actual wording (not just letters, such as Wishing Star Farms not WSF). Name of animal along with registration number, or completed application and fees. OR: Registered Farm Name to be entered, or written note for registration of farm name and fees. After you have put down the name (full name, including prefix!) and registration number of the animal, your name or farm name, please include the proper entry fee. Also make sure we have current name, address and phone number (and email if possible) of the entrant(s). State which program (animal, youth or farm) you wish to enter. DO NOT PRINT OFF these rules and mail them, we do not need them. A short cover note and your info is all we need to enroll you, there is no specialized form necessary for mailing. Remember! These points cannot start until the animal is actually registered and the owner/handler/youth is an ADMS member. Dues to timeframes and the postal system, you may inform us you are sending in enrollment (or use a CC/email) to have an immediate event count, but we cannot accept points from a previous event if the animal/handlers were not registered and enrolled in the program. Points will not start until you are formally enrolled, so be sure to enroll before that big show, event or parade. There is a five year time limit. However, if you have not earned your award at the end of five years, you simply need to notify us that you are still working on it. The time limit is to give us the opportunity to purge our files of those who are not planning to be active. Membership: Handler or owner of animal Youth, and owners of the farm must be active members and remain so for the full time of the award from enrollment to completion. If you do not renew your membership and skip a full year before renewing again, ALL YOUR POINTS WILL BE INVALID and you will have to enroll in the program and begin your points over again. Changes of ownership: If ownership of animal or farm changes, the new owner must join ADMS within the calendar year and the animal must be transferred in the Registry records within that calendar year or all points will be voided. If a farm changes ownership or a farm name is altered, the owners must notify ADMS that they are continuing with the program and must join ADMS or all points will be voided. You should inform new owners of an animal about its enrollment in the VHOF program so that they may continue to earn points after transferring the animal if they so wish. Keeping Points: When you enroll you will receive the sheets on which to keep your points. You may also use your home computer or any kind of spreadsheet if you keep the same basic format. Feel free to make copies of the sheets if you feel you will need additional sheets. Please keep your points carefully. You may have questions about how many points an event is worth. If so, drop us a line describing an event. Please keep in mind that it is the appearance at the actual event itself that counts. A particularly important show or an audience that is very enthusiastic about your animals is of a great deal of value to you personally, but goes not have any more value in the HOF point system than a small shows or an unappreciated performance. Please try and to have an official of an organized event sign your point sheets, or send us a copy of the results showing your name/Animal(s) name in the results as verification. Obviously this is not always possible. This award is truly on the honor system. However, when possible, a signature adds vaildity of points in case they should be questioned for any reason, and for your own protection a signature is valuable. PLEASE ENTER DATES, EVENTS AND POINTS VERY LEGIBLY AND IN READABLE FORM. If we cannot understand you point sheet, we cannot count your points. KEEP YOUR POINT SHEETS AT HOME UNTIL YOU HAVE ACCUMULATED THE PROPER NUMBER OF POINTS. When you have them, send your sheets in to the office. Keep any points that "spill over" to send in later for your Honor Roll. Youth - - 350 points (may use any number of animals, owned or borrowed, preferably registered, must be longears, list all names/breeds/types on the point sheet). Farm or Ranch - 400 points (more than one animal may be used, but all must be ADMS registered before the points begin to accumulate for farm). When you accumulate your points: Send in your point sheets to the ADMS office. Keep a photocopy for yourself just in case they don't arrive!!! Photos for Awards: Please send one good-quality photo (hard copy or jpeg format) with your point sheets. This will be used for your write-up in the next available space in the Brayer Magazine. We suggest write ups of 250 words, but this length can vary with the size of the space as well. You are allowed a half-page space. For example, see pages 6-8 of most issues of the BRAYER. Full pages may be awarded only for very special achievements. TROPHY: The winner of the VHOF award will be sent a trophy after the point sheets are submitted and accepted. Please allow us time to check your points, have the trophy prepared and sent. We hope you will be able to arrange to have your trophy presented at one of your local functions such as your club meeting or show. You will also be entitled to put HOF after your animals registration number. Don?t forget to do this when sending n papers of animals that your animal has sired or given birth to. UNLISTED ACTIVITIES: Donkey and mule people are some of the most versatile in the world! You have wonderful imaginations and your animals can take part in any activity that horses do, and some they don't. May of those activities can fit into the general categories given, even if they are not specifically mentions. However, if you have questions or cannot fit your activity into those categories, please give us a call or drop us a note and we?ll help you figure out how many points and event is worth. VERSATILITY HONOR ROLL: Those persons who have won their Versatility Hall of Fame in any category but would like to keep on accumulating honors may do so. All that is necessary is to keep accumulating points under the regular rules. When you reach the required number of points again (as listed previously) send in the point sheets along with a $5 office fee to the ADMS Office along with a note as to what it is for. Include the point sheets, photo and write up as before. We will send you a VHOF Honor Roll Certificate and list your name and write up in the Brayer. As long as you follow the rules you may accumulate as many of these certificates as you like. There is no limit, no time limit as long as you keep us informed. We have animals that have accumulated several dozen HOF certificates by active participation. Special Note for Farm/Ranch Entrants: A farm may use any number of animals to accumulate points, but animals must be previously registered (or registered at the time of enrollment) with ADMS before their points can be counted. If you have a new foal born and want the baby photos to count for their first points, register them and send their name in right away so the postings will count. If an animal that is accumulating points is sold out of the possession of the farm, it must stop accumulating points as of the sale date. However, the points it has accumulated up until that point are valid. Also, animals on the farm or ranch are NOT given the basic 10 points each for yearly work. Their points must be accumulated under the other categories. Farm and Ranch Entrants, please send us a list of the registered animals you will be using to accumulated the points along with their registration numbers. When you start using a new animal, please let us know so we can add it to your file. Animal's Regular Job: (other than Farm/Ranch category) You may start by giving your animal 10 points each year for whatever its regular work is. That is, your animal may be a pleasure riding animal, a breeding jack, a work animal, a guard donkey. If your animal would get more points by counting each individual thing it does (if its regular work is showing or endurance riding) then you would be better off not taking this ten points. Instead count each activity separately. If however, your animal?' regular job is something not counted for points, such as breeding or farm work, then you should take the ten points. Public events: This category covers many of the events that you may take part in, for example, appearances in a play or a Nativity scene, a performance of some kind such as doing tricks, a specialty rodeo act, appearing at a political rally or mall opening, giving rides to children at a party or event, visiting a nursing home or hospital, appearing at a school for educational purposes, and any of these various other public appearances that present your animals in a positive way to the general public by providing an educational opportunity. Such events may be one of a kind, or may run for several days (such as appearing at the children?s pavilion at the local Fair. 7 points for each day or each performance, whichever is applicable if the event is non-charity or is a paid attendence event. 10 points for each day or performance (whichever is applicable) if the event is for a registered charity or an obviously charitible institution such as for disabled individuals (hospital, nursing home). On the trail: trail rides may be for animals under saddle, or in harness. Youngstock that is not yet old enough to be used under saddle may take half-points for being ponied at a trail ride as long as the ride organizer or committee has agreed to let led (ponied) animals be present and participate. 10 points per day for a "formal" trail ride, organized and planned by a club or group. 3 points per day for "informal" trail rides with your friends (as long as you haven't claimed this as your animal?s regular job. At least one other person must accompany you on the trail ride. 10 points for competing in a properly sanctioned Endurance Ride. 40 points added if you are the tip winner in any category (including special categories created for longears). These are cumulative. 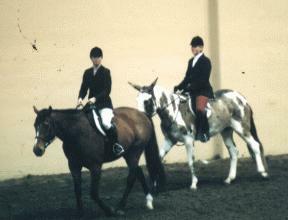 For instance, if you compete, win best conditioned and are also the first place winner, you'll have 95 points. Rodeo: For saddle mules or donkeys used as regular mounts, not as rough stock). 5 points for each event entered including Grand Entry. 5 points if you win any of the events you entered (all-Mule or regular rodeo). Parades: Animals may be ridden, in harness, led in-hand, led as ponied or trailed behind a wagon/cart, or ride on a float or other trailer as long as the animal is mostly visible and recognizable as a longear (ie they cannot ride in a closed trailer where no one can see them). Costumes/parade tack is allowable. 10 points for local parades for fairs, rodeos, holidays. 20 points for regional parades, major holidays, or as part of a mounted/driving unit. 30 points for major events, televised parades, such as the Rose Bowl or inaugural events. 10 points added if a trophy is won by your animal or group in any parade category. Media Coverage: Media coverage is very important to our animals. Media coverage mentioning either the animal, farm, or you is very valuable to our image. Even paid advertisment can count toward points. 5 points for an ad in your club newsletter (including the Brayer). One ad per issue per newsletter. 10 points for any kind of local newspaper coverage. 20 points for newspaper coverage with a photo. 30 points for national newspaper coverage. 40 points for national newspaper coverage with a photo. 10 points for an article or mention in an article in a commercial magazine (such as Western Horseman, Equus, Small Farm, Hobby Farm, Art Horse, etc). 20 points as above it is a mention or article with a photo. 10 points for radio interviews or mentions. 20 points for TV/Satellite coverage on a national program. See the beginning of this article for the new point placings for Internet coverage. 3 additional points for winning/placing against horses(or for donkeys placing over horses or mules). We will be adding a Printable Point sheet in the next day or so, for use with the Online Registration form. Remember you MUST already be enrolled to begin earning Points!